On October 12, 2008, the Tottori University of Environmental Studies held a meeting for the reading of essays by high school students at the Fifth National High School Student Essay Contest on Environmental Issues (TUES CUP). The TUES CUP aims to help high school students, who will play a pivotal role in the next generation, learn about the environment by writing essays on top-priority issues in the 21st Century. The goal is to promote interest in and education about solutions to environmental problems. Furthermore, it also aims to raise the awareness of high school students and ordinary citizens with regard to these issues and to disseminate information on the environment throughout Japan. The theme of the essay for this year's fifth annual contest is "Water in Our Life." 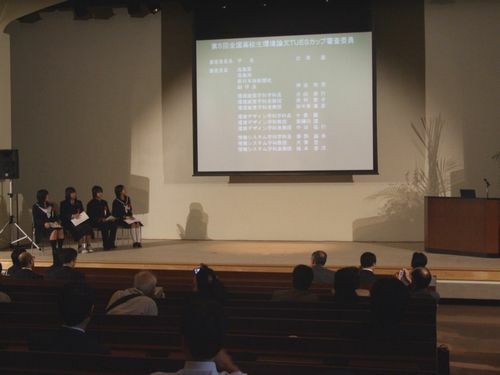 Ms. Aya Miyamoto, a first-year student at Shimane Prefecture Tsuwano High School, received the highest prize, the "Environment Grand Prix" with her essay, "Living with River." Talking with her family about the transition of the Tsuwano river running near her house, particularly in the past when the river played a significant role in daily life, she pointed out that we need to take responsibility for using and discharging water. The other winning essays included a report on an experiment in which a student examined ways to improve the immediate water environment, and an essay based on a student's experiences through community activities. This student insists that we need to change our awareness toward the environmental issues. A spokesperson said that the number of applications for the essay contest increases every time they hold this event. This year, 1423 essays were submitted from 22 prefectures in Japan, which is the largest number of applications since the contest began. The spokesperson added that high school students share an increasing awareness of environmental issues, and that environmental education is more accessible to classrooms than ever before.